In mountainous terrain, rock falls may be a hazard to such facilities as highways, railways and power generation plants. We provide full services for the mitigation of these hazards including identification of rock fall sources, modelling of rock fall trajectories and energies, and design of protection structures. Much of this work draws on the latest European and Japanese developments in this field. Details are included in the book Rock Fall Engineering (see Publications section of this website). Terrain hazard analysis – location of rock falls, landsides, run-out paths and distances. Identification of rock fall sources – rock fall dimensions, velocities, impact energies. Design of protection structures – wire mesh nets, fences, geo-fabric barriers and reinforced concrete sheds. Construction management – layout of protection structures, anchor and foundation testing. Performance evaluation – inspection of existing structures to assess performance and maintenance requirements. Documentation of rock fall events – impacts and trajectories have been recorded of events with heights up to 2000 m and geologic conditions including strong rock, colluvium and asphalt. These results can be used to calibrate rock fall models. Impact mechanics – detailed analysis of translating and rotating rock fall impacts with ground surfaces shows that the normal coefficient of restitution is a function of impact conditions such as the impact angle and rotation, and not the type of ground surface. Model testing – model protection structures have been tested, and filmed with a high-speed camera to understand how rock falls interact with the structures when they impact at a shallow angle to minimize the adsorption of impact energies. 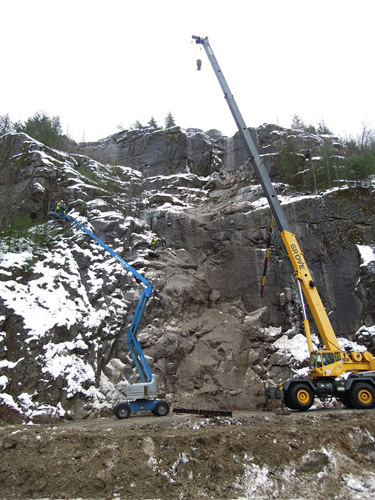 Full scale testing of AttenuatorsTM – a test facility has been developed in a quarry that allows concrete test blocks and natural rocks with masses up to 5540 kg (2510 lb.) to be dropped from heights up to 55 m (200 ft.). The tests were instrumented with high-speed cameras, load cells, a data acquisition system running at 2000 Hz, and "smart rocks" containing 3-D accelerometers and 3-D gyroscopes. Product development – theory of impact mechanics and full scale testing results have been used to develop AttenuatorTM structures that minimize absorption of impact energy by deflecting rock falls into the ground. Patents – US patent has been obtained for "Wave Net" that is an alternate form of AttenuatorsTM.